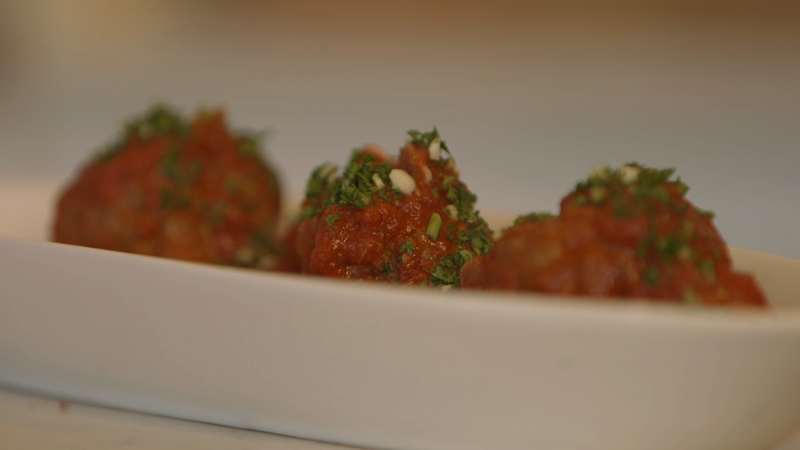 These meatballs are so good that it’s almost un-bear-able! Dan infuses the bear meat with paprika, bread crumbs, olive oil, an egg, and salt. Right there you have a tasty treat, but Dan continues with a truly Italian sauce complete with red wine, garlic and San Marazano Tomatoes. All of this combined and topped with a fresh gremolata. Buona mangiata! • Mix together and mold into meat balls. • Sweat onion over a medium heat in olive oil. • Add garlic, red wine and crushed tomatoes. • Add raw meatballs, cover and simmer for ½ half hour. • Finely chop the parsley, lemon zest and garlic then mix together. • Sprinkle gremolatta over hot meatballs and tomato sauce and serve.